Masters degrees in programs like Organizational Leadership, Adult Learning, Organizational Psychology, EduTech, and more, are becoming more common in the legal PD field and professional services more widely. How are these concepts being leveraged in other progressive industries? What are the current and future opportunities for these concepts in law firms? A day is certainly not enough time to replicate a graduate education, but just enough to introduce attendees to the types of programs our members have pursued; provide a foundation of concepts, lingo, and applications; and offer ideas for continued learning. 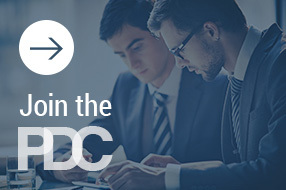 We’ll look to leaders outside the legal industry and hear from new faces within our own PDC community. Attendees will choose their own “deep dive” among concurrent afternoon sessions to explore relevant industry topics like organizational coaching, leadership and technology. Sessions will focus on practical takeaways and opportunities to interact. Join us for this one-day intensive as we explore new areas and new ideas, while connecting with friends new and old. Click here to view the schedule for the Winter Meeting. We will continue to update the schedule as information becomes avaialble. Oneline registration for the PDC Winter Meeting is now closed. You will be able to register onlsite at the registration desk located outside of the Oriental Ballroom. Please contact PDC staff at info@pdclegal.org if you have any questions. The PDC's Winter Meeting is held in conjunction with NALP's Professional Development Institue (PDI). The PDI registration is now open. For information on how to register, visit the NALP website. For more information about PDI, you can download their informational brochure. Sleeping rooms at the Mandarin Oriental are sold out for the PDC Winter Meeting and the NALP/ALI CLE 2018 Professional Development Institute (PDI). If you are still in need of a sleeping room, please consider these alternative hotels that are within walking distance to the Mandarin Oriental. Please note: the PDC and NALP do not have hotel blocks at these properties. Thank You Winter Meeting Planning Committee! Thank You to our Winter Meeting Sponsor!